The center of Paris is Notre Dame. This is true both literally and figuratively. The Gothic cathedral is there on Île de la Cité, the island in the Seine in between Paris' Left and Right banks, convenient and inescapable for the more than 12 million people who visit it every year. Just outside, a Point Zero marker measures the distance to everything else in France. And Notre Dame is there in more than 850 years of French history: in paintings, daguerreotypes, songs, novels, war photos, awed selfies. On April 15, Notre Dame de Paris caught fire, and its interior was almost entirely destroyed. The wooden roof burned clean through, and the proud spire – actually added between 1845 and 1879 – toppled over like a child's toy set. Outside, thousands of horrified onlookers held up their phones. Some began to sing hymns. Smoke and flames rise from the landmark Notre Dame Cathedral in central Paris on Monday. 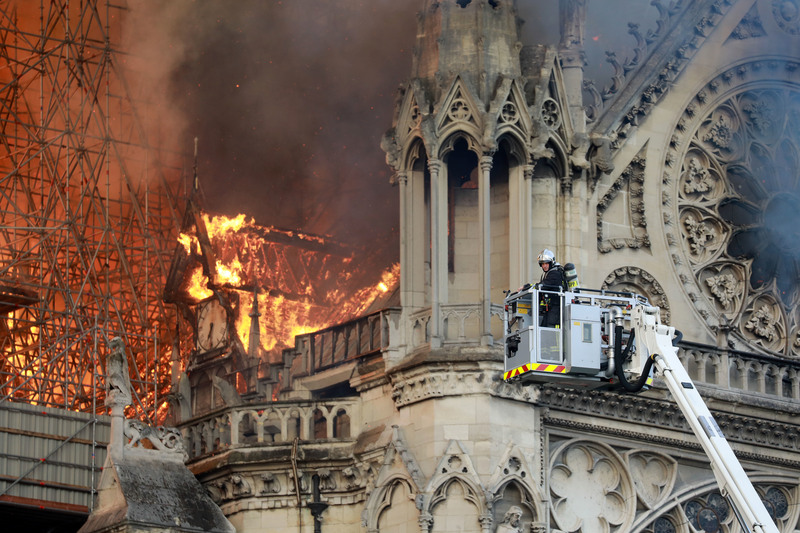 It took a heroic effort by more than 500 firefighters merely to contain the spread, rescue a few of the many artworks inside, and preserve the structure and the cathedral's two towers. But from a cultural perspective, the damage has already been catastrophic. The aerial shots showed the halls of the church, completed in 1345, lit up in a blazing cross. Stained-glass windows, some of them dating back to the building's original construction, were destroyed. 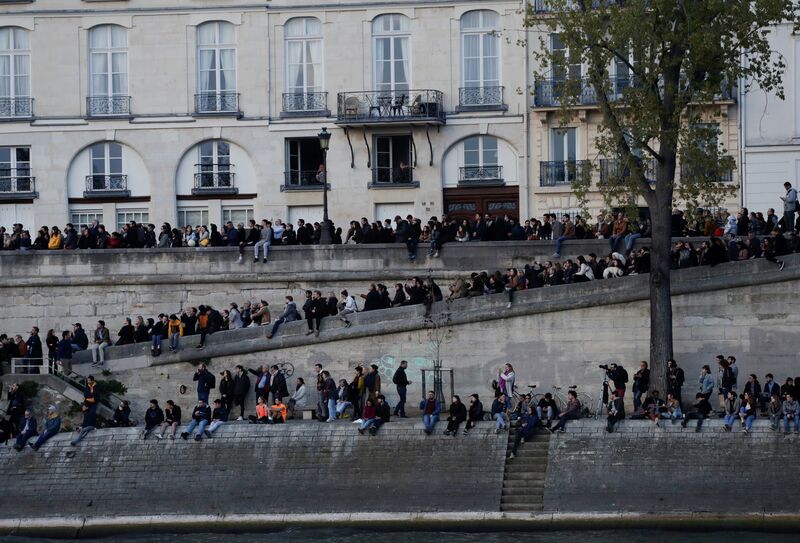 How did it feel to watch this in Paris from behind a police barrier as the flames roared overhead? In 1831, author Victor Hugo published his beloved novel Notre Dame de Paris, known in English as The Hunchback of Notre Dame, in which he describes the cathedral as "a vast symphony in stone." 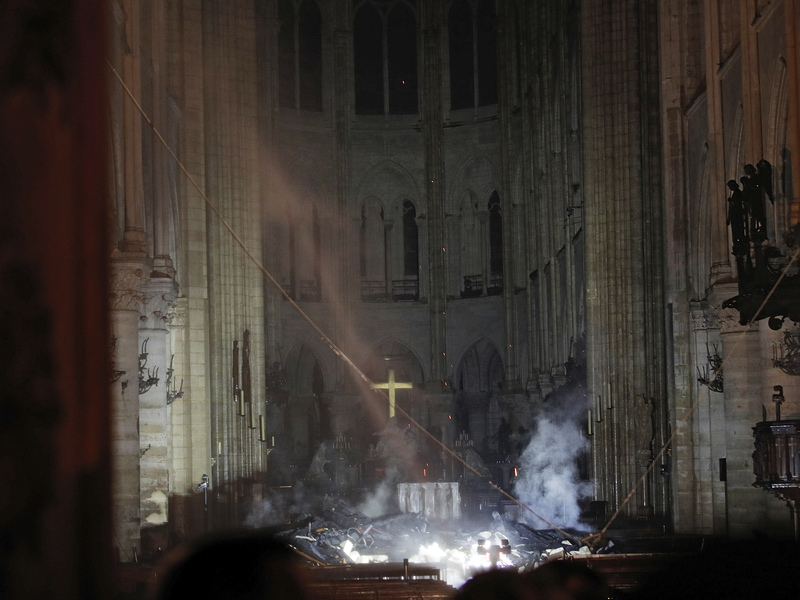 Smoke rises in front of the cross in the interior of Notre Dame Cathedral in Paris. 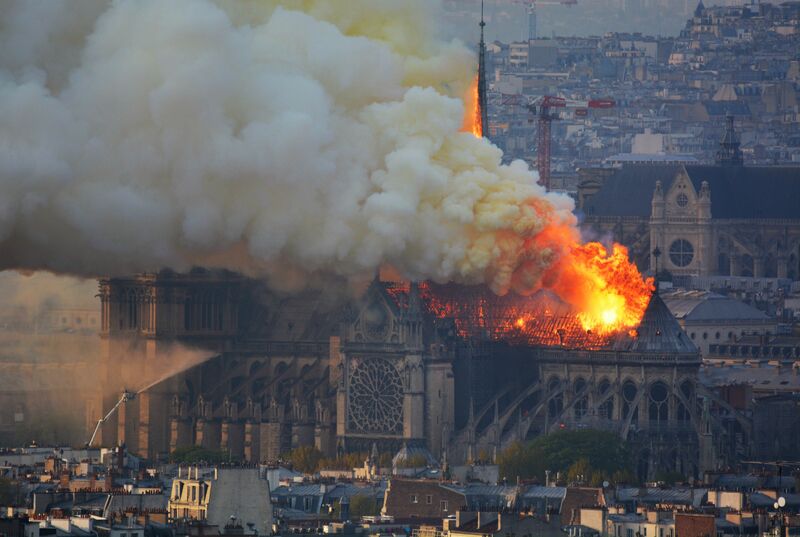 A catastrophic fire engulfed the cathedral on Monday, as tourists and Parisians looked on from the streets below. Notre Dame Cathedral's spire is seen in December. It collapsed in Monday's blaze. Only the scaffolding surrounding it is left on Tuesday. Online, Americans shared their remembrances of visiting the cathedral and climbing the towers. Practicing Catholics, members of non-Christian faiths and nonreligious people all recalled being overcome by a sense of spiritual awe when they stepped inside the structure and returning years later to light candles for loved ones. They talked to Notre Dame staff, who said their favorite part of the job was watching the light change over Paris from the tops of the towers. 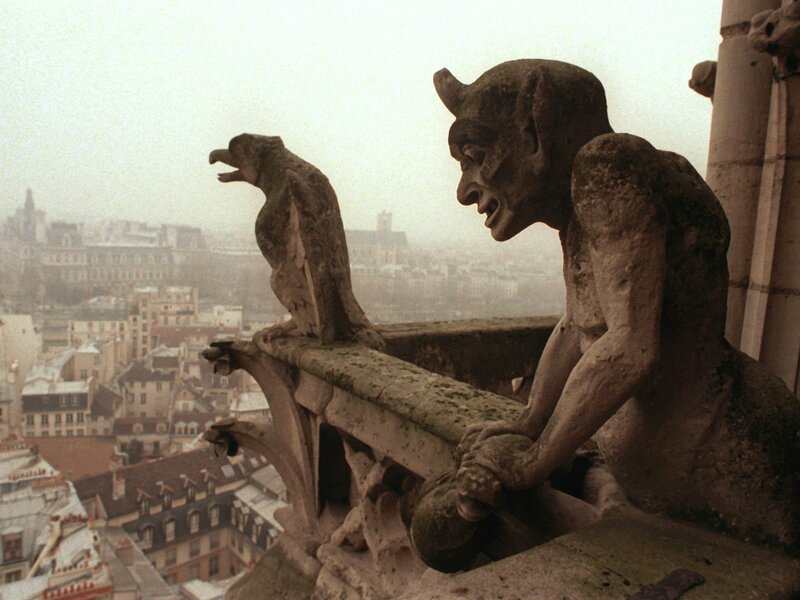 Gargoyles watch over the streets of Paris from the top of the Notre Dame Cathedral in 1996. Seeing Notre Dame and its rooftop gargoyles overlooking so many visual representations of Paris over the years, "you get the sense of the cathedral as this place that is solid and immovable, and kind of watching history unfold underneath it," said Catherine Clark, an associate professor of French studies at the Massachusetts Institute of Technology. Construction on Notre Dame began in the 12th century to replace a smaller cathedral, on orders from King Louis VII and a series of bishops culminating in Maurice de Sully. Over more than a century, it morphed from a traditional Romanesque architectural style to an innovative Gothic design. Its use of high buttresses and many stained-glass windows allowed more light into the hall than in previous church designs. Author Victor Hugo described the cathedral as "a vast symphony in stone" in his beloved 1831 novel, Notre Dame de Paris. A position right by the city's only hospital at the time, L'Hôtel-Dieu, ensured the church's creation would become an essential element of Paris life, Clark said. No one had ever seen anything like Notre Dame before, and the grand acoustics of its ribbed interior led to musical pieces, like the 13th-century repertory Magnus Liber Organi, written specifically to be performed inside the cathedral. "The acoustics of that specific space are, in a pretty literal way, baked into the DNA of classical music," said Sophie Benn, a musicologist at Case Western Reserve University. Statues that had sat around the spire of Notre Dame were spared because they had already been removed restoration company's Socra workshop. Notre Dame has a conflicted role in French history, as a symbol of both national character and religious significance. The association with Catholicism became a liability during the French Revolution in 1789, as hordes of secularists stormed the structure, pillaging artwork and claiming the cathedral for the atheistic Cult of Reason. And in keeping with the royalty purge of the time, they beheaded every statue of a king inside. But Notre Dame persisted. Only a few decades later, with the landmark having fallen into neglect and disrepair, it gained a crucial celebrity advocate in Victor Hugo. The author believed strongly in the value of architectural preservation, and wrote Notre Dame de Paris as a restoration campaign. Thousands watched in horror as Notre Dame burned on Monday, some capturing the moment on their cell phones or singing hymns. Hugo's wistful, achingly human tragedy of the hunchback named Quasimodo who both lives in and stands for the cathedral itself, ringing its iconic bells and offering sanctuary to a beautiful gypsy named Esmeralda helped spur on public support for the building that led to a major renovation in the 19th century. The gargoyles and the spire were added; the beheaded kings were re-headed. The novel remains a gateway into the majesty of Notre Dame today. "I was so fascinated by this idea of Notre Dame de Paris as a kind of Quasimodo itself, an amalgamation of different types of architectural styles accumulated over the centuries and centered by this bright, cyclops eye that was its rose window," said Leigh Giangreco, a reporter at The Capitol Forum who studied in Paris in 2012 and recalled reading Hugo's book while viewing the cathedral across the Seine at the Shakespeare & Company bookstore. 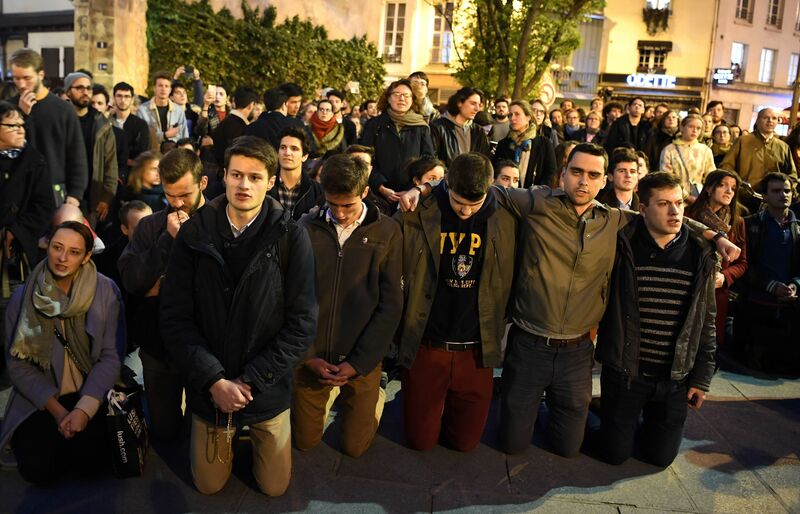 People kneeled in prayer as the flames engulf the Catholic Notre Dame Cathedral on Monday. 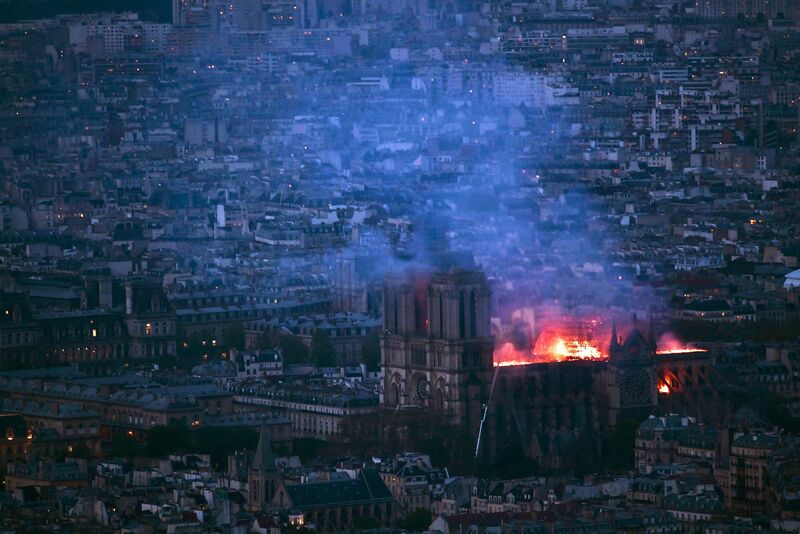 "All I can think of today, watching Notre Dame burn, is the end of Hugo's epic novel," Giangreco said. "After Esmeralda and Frollo die, [Quasimodo] sobs deeply, 'Oh! All that I have ever loved!' "
The cathedral's role as an onlooker of history continued into the German occupation of France during World War II. In 1944, when the French mounted an uprising against the Nazis, the area in front of Notre Dame became a key location of the fighting, as resistors built barriers and hurled Molotov cocktails at German troops on Île de la Cité. And after victory, American soldiers were present for the ringing of the bells at the cathedral, signifying that France was now free. The French troops hosted a feast of thanksgiving at the cathedral, where some of the final shots of the war were fired, as Nazi snipers took final, desperate aim at the rejoicing crowds. From Montparnasse Tower, flames and smoke can be seen billowing from the roof at Notre Dame Cathedral, about 2 miles away. "A lot of the photos of the liberation of Paris have Notre Dame in the background," Clark said. "It's this kind of backdrop for this moment of national liberation." Notre Dame was not the first cultural institution to see such sudden mass destruction this century, and it won't be the last. In September 2018, the Museu Nacional in Rio de Janeiro was gutted by a blaze that destroyed the building and millions of historical artifacts in a matter of hours. And since 2014, the Islamic State has methodically destroyed dozens of historic mosques, libraries and heritage sites across Syria and Iraq. Physical structures may feel like safe, permanent homes for humanity's history, but they are also fragile, vulnerable to human error and malice alike. 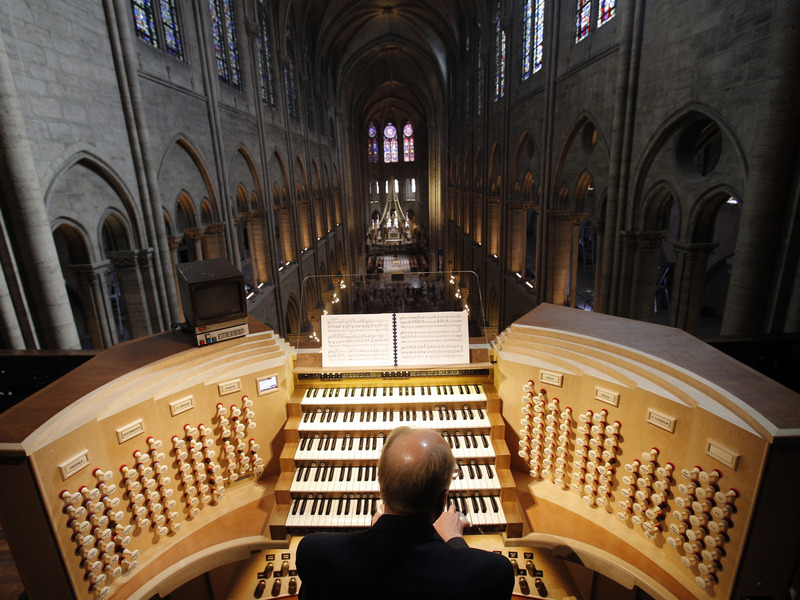 Organist Philippe Lefebvre plays at Notre Dame in 2013. Sophie Benn, a musicologist at Case Western Reserve University, says the acoustics of the cathedral are "baked into the DNA of classical music." Yet some artifacts were saved, occasionally by pure chance. 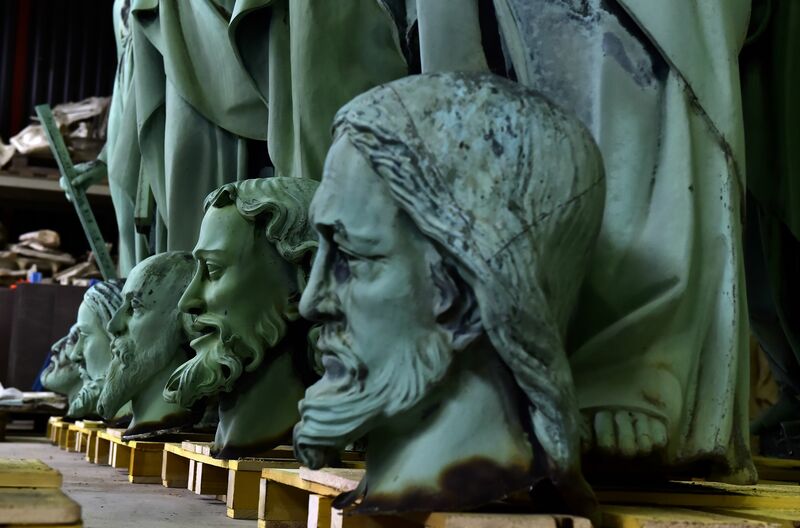 Only days before the fire, some of Notre Dame's statues were airlifted out of Paris for restoration. And Notre Dame's legions of admirers the world over, particularly Americans, stand ready to aid in a reconstruction. An American nonprofit, Friends of Notre Dame de Paris, was formed in 2017 to raise funds for the current restoration project at the cathedral. Other groups have already begun fundraising campaigns. 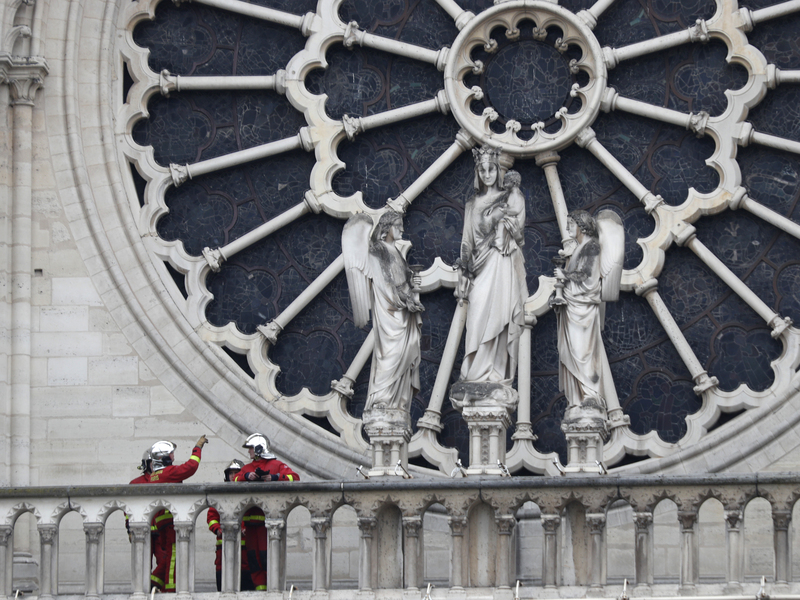 Firefighters talk near the cathedral's rose window on Tuesday. Experts are assessing the blackened shell of Paris' historic cathedral to establish next steps to save what remains. When it comes to French historical preservation, "Americans are the biggest contributors from abroad," said Anne Monier, a doctoral candidate in social sciences with the Paris university L'École normale supérieure and the author of a forthcoming book about American fundraising groups for French preservation. "There is a very strong, sentimental bond to French culture, to European culture, because many Americans have their roots in Europe," Monier said. "I think they really consider that French culture, and European cultural institutions, are a part of their legacy."